Respected manufacturers of silence-focused PC cases like be quiet! and Fractal Design use a number of tricks to keep noise levels down. These often include specially designed fans, thick pads of noise-damping foam, sealed front panels, and elaborately baffled vents. We tend to prefer high airflow to silence when given a choice, and it usually is presented that way: as a choice. The reality is that it doesn’t have to be a choice, and that an airflow-oriented case can, with minor work, achieve equivalent noise levels to a silence-focused case (while offering better thermals). Our testing tends to reinforce that idea of a choice: our baseline results are measured with the case fans at maximum speed and therefore maximum noise, making cases like the SilverStone RL06 sound like jet engines. The baseline torture tests are good for consistency, showcasing maximum performance, and for highlighting the performance differences between cases, but they don’t represent how most users run their PCs for 24/7 usage. Instead, most users would likely turn down the fans to an acceptable noise level--maybe even the same level as intentionally quiet cases like the Silent Base 601. Our thesis for this benchmark paper proposes that fans can be turned down sufficiently to equate noise levels of a silence-focused case, but while still achieving superior thermal performance. The candidates chosen as a case study were the Silverstone Redline 06 and the be quiet! Silent Base 601. The RL06 is one of the best-ventilated and noisiest cases we’ve tested in the past couple of years, while the SB601 is silence-focused with restricted airflow. One variable that we aren’t equipped to measure is the type of noise. Volume is one thing, but the frequency and subjective annoying-ness matter too. For the most part, noise damping foam addresses concerns of high-frequency whines and shorter wavelengths, while thicker paneling addresses low-frequency hums and longer wavelengths. For today’s testing, we are entirely focusing on noise level at 20” and testing thermals at normalized volumes. Be quiet!’s cases are divided into three groups: Dark Base cases are the high-end flagships, Pure Base are (relatively) budget, and Silent Base is the range of cases in between. We’ve most recently covered the Pure Base 600 and the Dark Base Pro 900 at either end of their price spectrum, and now we’re reviewing the Silent Base 601 in the middle. The be quiet! Silent Base 601 is priced at around $130, depending on when you check retailers, and competes most directly in price with the NZXT H700, Cooler Master H500P Mesh, and Fractal Define R6. Our Computex 2018 coverage continued as we visited the BeQuiet! booth. This year, Be Quiet! announced the new Dark Rock Pro for socket TR4 (Threadripper), timely for Threadripper 2, and also showed a trio of refreshed cases -- the Silent Base 801, 601, and Dark Base 900 Rev 2.0. The Dark Rock Pro TR4 is specifically designed with AMD’s Threadripper socket TR4 in mind. The Dark Rock Pro’s only real difference from previous iterations is the new full coverage block for Threadripper. The new cold plate is designed to help ensure full die coverage on Threadripper, which we discussed back in August of last year. We’ve previously found there to be a measurable difference when using TR4 full coverage coolers vs. non-TR4 ones. Price and release date were not available at this time. Be Quiet!’s Dark Base cases are their highest-end silence focused models, and the newest of these is the Dark Base 700. We recently reviewed Dark Base Pro 900, but the 900 and 700 are much different cases. Naming conventions imply that the 700 is simply a scaled-down mid tower version of the full tower 900, but there are significant differences in tooling and features despite their external similarity. The Dark Base 900 (including the Dark Base Pro) has an MSRP of $200 ($250 for the Pro), while the new Dark Base 700 has an MSRP of $180. The Dark Base 700 is loosely related to the 900, primarily in its invertible motherboard layout and material and panel quality, both of which are high for this case. The Be Quiet! 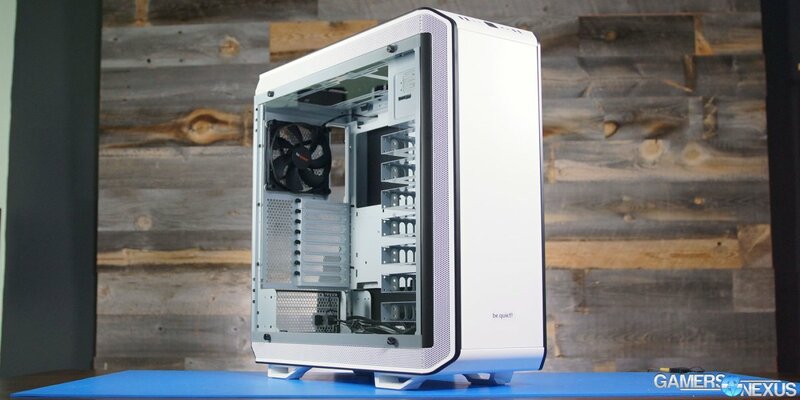 Dark Base Pro 900 - White Edition is an upgraded but functionally similar version of the Dark Base 900, the highest of the high end Be Quiet! enclosures. The tagline for this model is “outstanding flexibility and silence,” referring to the fact that the motherboard can be inverted, a feature we previewed at Computex a year ago. We first spotted the white edition at this year’s Computex, where Be Quiet! was showing off the limited edition white variety. The newest version of the case differs only from previous DBP 900 cases in its color, but as we never reviewed the original Dark Base Pro 900, we’ll be going through the complete review and benchmark today. This Dark Base Pro 900 review includes thermal testing for standard and inverted layouts, ventilation/duct testing, noise testing, and assembly. Continuing our Coverage of Computex 2017, we met with the Be Quiet! team at their booth to discuss some of their new and upcoming products. We took a look at their Silent Loop CLC CPU cooler, the new SFX-L PSU, the Shadow Rock TF2 air cooler, and the limited edition Dark Base Pro 900 - White Edition case. The Dark Base Pro 900 was a case we covered last year at Computex, if it feels familiar. This year, Be Quiet! displayed their new iteration of the Dark Base Pro 900 - now in white. The White Edition uses the exact same tooling as the Dark Base Pro 900, with changes entirely cosmetic. Be Quiet! reps noted that the color-matching process was the most time consuming, and that the run will be limited at first to gauge market reception. The first all white case from Be Quiet! will be limited to 2000 units worldwide, with a specific number being given to each enclosure (a nameplate in the top-right corner, near the drive cages). The White Edition will ship with an included three 140mm Silent wings 3 fans in black, contrasting the white (we’re not sure if we like that just yet), and hosts all the usual features of the DBP900. The chassis is capable of hosting three 140mm fans at the front, another three 140mm fans on top, a single 140mm at the rear for exhaust, and another single 140mm fan at the bottom, near the PSU; that brings it up to eight possible fans in total. The Pure Base 600 is the newest, cheapest, and smallest of Be Quiet!’s silent enclosures, but it manages to hold its own in the current lineup. It’s a stark contrast to previous Be Quiet! cases like the Silent Base 800, a chunky enclosure that we found pleasant to work with but fairly expensive at $140. As a $90 mid tower, the Pure Base 600 fits into the same category as the S340 Elite (reviewed) and other high-end cases, although notably without tempered glass or indeed any side window at all. In fact, Be Quiet! also manages to dodge the entirety of the RGB LED craze, making the Pure Base 600 oddly unique in its “older” approach to case features. Granted, there will be a tempered glass variant in March for an extra $10. German manufacturer be quiet! has launched an update to the Pure Power series of entry-level PSUs: the Pure Power 10 and Pure Power 10 CM models (CM for “Cable Management”). We previously covered the new Pure Power PSUs at CES last year, where it was revealed that the series would be moving to 80 Plus Silver certification (for models at and above 400W) and that the cables would be changed to solid black by popular demand. In speaking with be quiet! at that CES meeting, we also learned that silver-rated PSUs are rough listing on Newegg, since there are so few of them; folks sorting by 80 Plus rating often skip over Silver. The 300 and 350W supplies have one PCIe connector, 400-500 have two, and 600W+ have four. Modular cables are low-profile and fixed cables are (black) sleeved.